It’s always nice when you can get an advantage over motor traffic by cycling instead. Some people riding already do this by sneaking through intersections when other traffic is stopped. 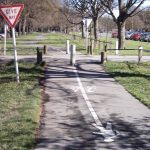 This doesn’t tend to do much for cycling-motoring relations (as has been implied by recent events in Auckland), but there are ways to legitimise these behaviours via special cycle facilities. In Christchurch, there are a couple of neat examples of how this can be done. Firstly, out in Linwood, at the Buckleys Rd – Russell St intersection, there is a cycle bypass of a signalised T-intersection. The bypass allows riders at the top of the T to go around the intersection via a shared path shortcut. 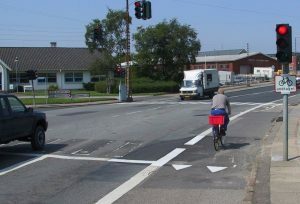 At the Moorhouse-Waltham-Barbadoes intersection, a slip lane is provided on the Waltham Road approach to allow riders to hop up onto the footpath and go around to Moorhouse Ave. The design is fairly good at minimising the potential for conflicts between walkers and riders. These types of facilities are relatively easy (and inexpensive) to implement. 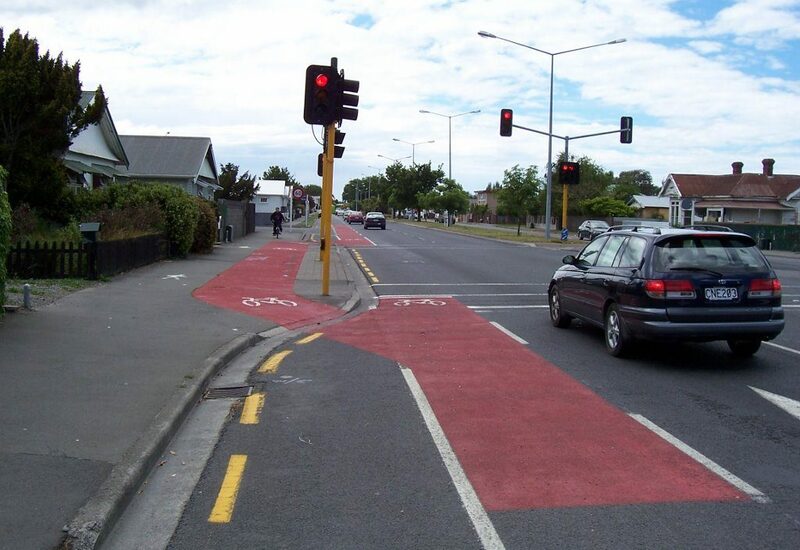 So they could possibly form part of the “quick wins” Cycling Targeted Improvements planned for Christchurch. 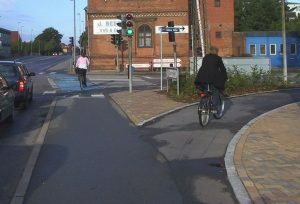 What do you think about these cycle bypasses? Any other places where they could go in Chch? Credit to the well meaning engineers who devised these silly workarounds; but let’s not get too excited about awkward, expensive bricks and mortar solutions whose sole purpose is to bypass stupid road rules. It’s the ‘bicycle exempt’ signs from Europe that show real cleverness. I still think this is fantastic and all credit to the traffic engineers or whoever put these in place, we need many more so cyclists are seen as able to get safely around the corner without having drivers swear at them etc when they turn left with nothing coming. (As drivers can legally do in America on a red light also). this is a good thing. 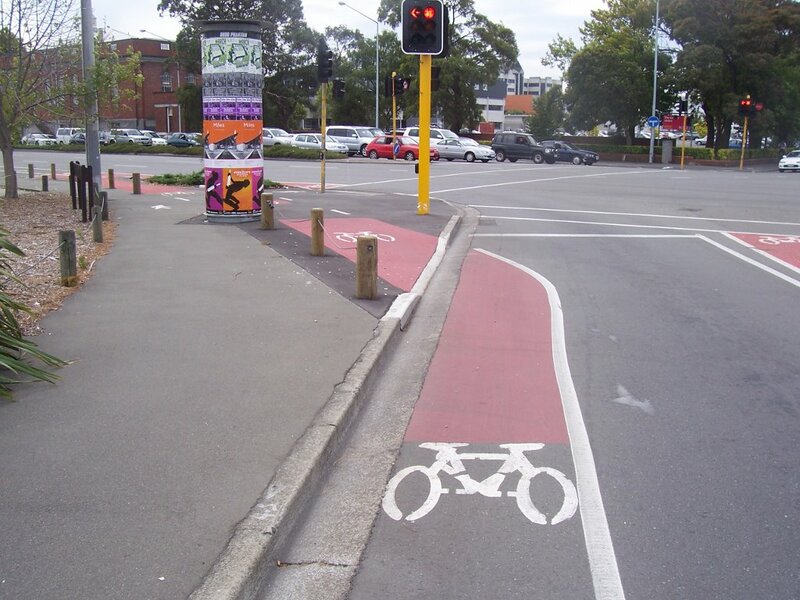 A cycle bypass could be done at the Dunbars Rd/Halswell Rd T intersection? Yes I have often had that exact thought about that one, but of course when the Quarrymans Trail is complete I would most like not use Halswell Road at all. Actually I have wondered if in fact they would reroute Milns Road to make it a cross there to stop cars having to do a right turn over Halswell Road just before the lights.